Ahh, Tuscany. I can almost taste the earthy Chianti Classico and the bowl of al dente pici in a light pecorino "sauce" as I type. We all can't help but associate good food and plentiful wine when we think of Tuscany. And that's for good reason. Tuscany is home to hundreds of wineries and serves up some of the most simple yet delicious food around. 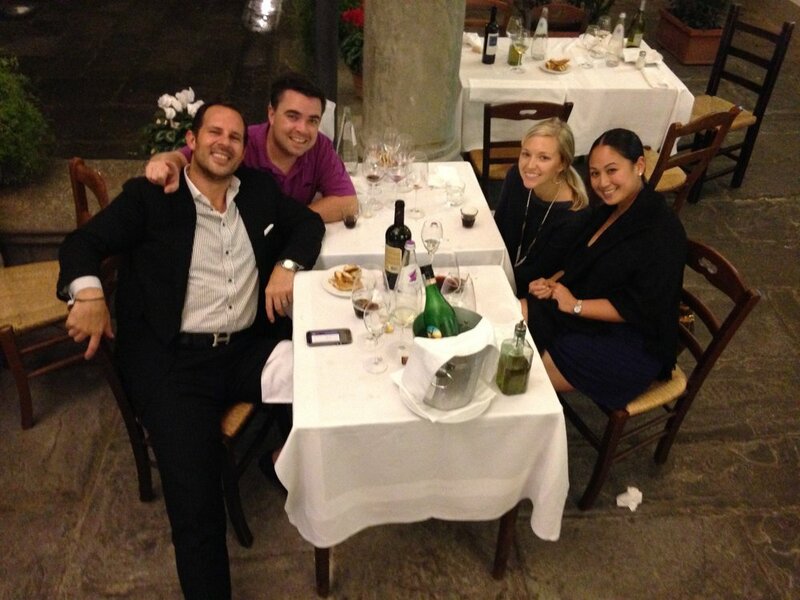 And Florence, being the capital of Tuscany, is full of amazing dining experiences. I love the Italian approach to eating--whatever's in season and whatever's nearby. Here in the States it's become trendy to "eat local" but in Italy it's just what you do. And I also love that in this region in particular, the dishes are quite simple but so incredibly delicious thanks to the fresh, quality ingredients used. That pici that I mentioned above, I recall having for lunch in a casual trattoria one day and being blown away only by 4 ingredients-- pasta (homemade of course), olive oil, pecorino cheese, and black pepper. My husband ordered penne alla pomodoro (pasta with tomato sauce, yup that's all) and he still talks about it. With good food must come good wine and luckily there is plenty of that available. Tuscany is known for its reds thanks to the sangiovese grape that grows on its vines. There are some whites available (Vernaccia di San Gimignano being a good one) but reds definitely dominate this region--Chianti, Brunello di Montalcino and Vino Nobile di Montepulciano to name a few. And we can't forget about the lovely dessert wine--Vin Santo. The local thing to do is to sip that with cantucci (what biscotti are known as in this region) for dipping. Italy takes their wine very seriously (no new info there) and has a rating system which can help consumers distinguish the quality. Top quality wines are labeled DOCG, followed by DOC, and lastly IGT. You will see this on menus and on a label on the bottleneck. Now, let me say that IGT doesn't mean the wine is bad, it just means that it hasn't met the strict regulations (certain percentage of grape variety, location in which it's produced, etc.) that DOCG and DOC wines must meet to wear the label. Unless you're a sommelier or wine connoisseur, chances are the house chianti you order with dinner that is labeled IGT will be fantastic and only about 8 euro a bottle. Tip: When ordering wine, do yourself a favor and choose something from Tuscany. Just like eating local the Italians like to drink local as well. And when else are you going to be in the middle of wine country able to sip a red made by Giovanni down the street? It doesn't get any better than that. The only thing I've failed to mention is coffee or caffé as it's known in Italy. Stay tuned for Caffé Cultura:101 in which I will fill you in on what you need to know about ordering coffee in Italy. In the meantime, buon appetito! And sorry if I made you hungry.